Here at Yogi Hair we are feeling generous and want to make your bad hair days good ones! 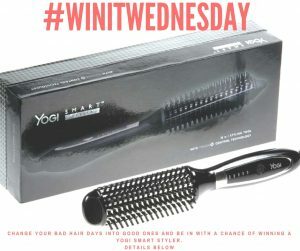 Enter our #WinitWednesday competition across Twitter @yogihair, Facebook @YogiHairWand and Instagram @yogihairwand to be in with a chance of winning a fantastic Yogi Hair Smart Styler. Employees of Yogi hair and their families are not eligible to enter. Closing date is midnight 03.04.18. The winner will be drawn at random from all valid entries received and will be notified via Yogihair Facebook page within 7 days of entering.